I’ve been wanting to do this for quite sometime and finally got around to it after Christmas. My son is in school in Chicago, my step-daughter lives in Atlanta, and Paris, ahhh, well Paris….shouldn’t everyone know the time in Paris? It reminds me of Europe and old train stations. Since I spend so much TIME doing laundry I thought this would be the perfect spot! These are 9” clocks from Target that cost a whopping $5 each. I made the tags with cardstock and cut out the letters with my Cricut machine. This is my laundry room since it’s been painted in Sherwin Williams Versatile Gray. I love this color as it’s not too gray. It’s definitely a warm gray. I keep this rolling laundry cart from Pottery Barn under the laundry shoot to catch the dirty clothes the kids would send throw down from their second floor bathrooms when they were home. It has the cutest metal tags that read dry clean, whites, and darks. The door is glass and etched with “Laundry”. I know this valance looks plain but there’s a great story behind it. Last summer I was shopping in Ethan Allen when they had their Designer’s Floor Sample sale. If you’ve never shopped one of these you must. Things that have been on the showroom floor are drastically reduced in price. Most people think furniture, but what you don’t realize is that when they update their showrooms, they also sell the custom made window treatments that were used on the mock windows in the different rooms along with bedding, etc. They had two pair of pinch pleated drapes and two matching valances on sale for $250 for each set, regularly $1400. Yes, I paid $500 for 6 pieces of custom made window treatments that would have regularly cost $2800. The fabric is a soft white cotton/linen blend with variations of thin blue stripes. The valances were already mounted on a board. All pieces are fully lined and the trim is gorgeous in person…not too fussy…just very tailored. I know they are a bit wide for the window, but it was too good to pass up. You’ll have to wait to see where I used the drapes. I got these great café shelves at Ballard Designs and filled them with fun things. French enamelware, lavender, a French rug beater, and old handpainted clock face, and the large enamel 14 that I found at the Paris Flea Market. Castle & Cottage Signs painted the awesome sign. That’s an ironing board mounted on the wall. It’s the sturdiest I’ve ever had that was on the wall. I’ve had the “built-in” ones with the door and I didn’t much care for their strength. It’s called a Lifestyle ironing center and it comes with the cover but I don’t use it. The board actually swivels 180 degrees. Okay I need that ironing board. I wanted a built in one and we didn't ever have one put in so I lug the great big very heavy Williams Sonoma board out. I need one like yours just to iron a piece now and then. Great laundry room. I love that ironing board too! Please tell me your laundry room doesn't always look like this! Where's the dirty laundry? It's just beautiful! What bright fresh look for your laundry room ~ love the clocks, timeless and a touch whimsical! Seriously, if my laundry room looked like that I'd be washing clothes every single day. Whether they were dirty or not! Gorgeous laundry room....and I love the clocks...so nice to keep up with the "times" of your loved ones and the "place that you love"....That ironing board is the greatest! !...just wish I had a wall to attach it to!! Great laundry room, Kim! Love the clocks!! I just wish I could keep mine that clean all of the time! The ironing board is fabulous! I need and want that ironing board.. (smile). Very nice laundry room, great inspiration. Thank you for sharing. Your laundry room is too cute! I am finishing mine up this weekend. LOVE that ironing board, and I do not like to iron. What an awesome and so spacious laundry room Kim. Comparatively, you got a great deal on the window valances! Love, love, love the the clocks on the wall! I have a cricut machine that I've only used a couple of times but you have inspired me! I hate folding clothes but if I had a landry room like yours I'd put a television set in there and iron and fold clothes for at least a couple of episodes of HGTV. Some day, a girl can dream of a gorgeous laundry room. Love the ironing board too! Youd did a faboulous job on the room! You'd think I could spell but I need a stronger pair of glasses so I can see what I'm typing lol! 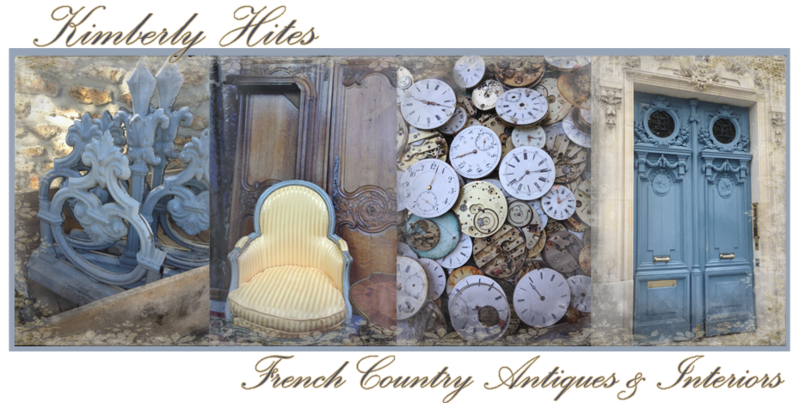 I specialize in French Country antiques & interiors at Thoroughbred Antique Gallery in Lexington, KY where you can find my decorative French antiques for the home and garden. I'm a Francophile in constant pursuit of beautiful things for the home.These are my notes about antique furniture, décor, and travel. Maybe something I share will give you some French Country inspiration. Click on the About tab under the header to learn more. Merci! A BIG Announcement…Are You Dreaming In French?